Anyone trying to gauge how far professional wrestling has come need look no farther than last week’s announcement that WrestleMania 33 is coming to the Orlando Citrus Bowl in April 2017. Gov. Rick Scott, Orlando Mayor Buddy Dyer and Orange County Mayor Teresa Jacobs all were on hand to join World Wrestling Entertainment Chairman/CEO Vince McMahon in announcing the event is returning to Orlando for the first time since 2008. Not bad company for a sport that 50 years ago could be found only by carefully twisting the television’s UHF knob on a Saturday morning. The reason for the big political backing? WrestleMania (indeed, all professional wreslting) has become an economic development force. As was widely reported at the time of the announcement, WWE officials say the sport’s weekend-long signature event draws more than 100,000 visitors from across the U.S. and the world to the host city, generating at least $100 million in economic impact annually for the last four years. Eight years ago, WrestleMania drew more than 70,000 fans to the Citrus Bowl and brought in at least $50 million to the city. McMahon, the business-savvy promoter who turned WWE into a global phenomenon, was in classic form at the news conference announcing the event. Some of McMahon’s biggest stars were on hand, and they offered kudos – often in a light-hearted way ­­– to the host city. State and local leaders were no less thrilled to have WrestleMania coming to town. “We’re excited to bring this event back to Orlando. 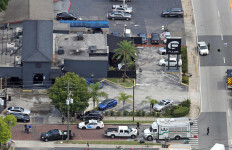 Florida set a tourism record by welcoming 105 million visitors in 2015, and WWE will help bring even more visitors to Florida in 2017,” said Scott. If the intersection of wrestling and political leaders seems a bit jarring, consider this. WrestleMania 33 will mark the 10th anniversary of an event that is unique even by WWE standards. WrestleMania 23, at Detroit’s Ford Field, featured a “Battle of the Billionaires” in which McMahon challenged a famous billionaire to a match in which each would choose to have a representative wrestle on their behalf. The winning billionaire would get to shave the head of the loser. McMahon’s representative, Umaga, lost to the rival’s representative, Bobby Lashley. After the match, McMahon had his head shaved. The billionaire doing the shaving? “The World’s Largest Outdoor Cocktail Party” – aka the annual Florida-Georgia football game – is staying in Jacksonville through 2016. 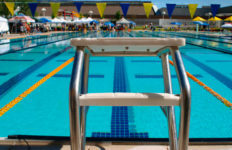 The two schools and Jacksonville officials announced a five-year extension of the agreement that has kept the game in the city for most of the last 85 years. The contest will continue to be played at EverBank Field, home of the Jacksonville Jaguars. EverBank Field in Jacksonville. Photo Credit: Ryan Ketterman for Visit Jacksonville. 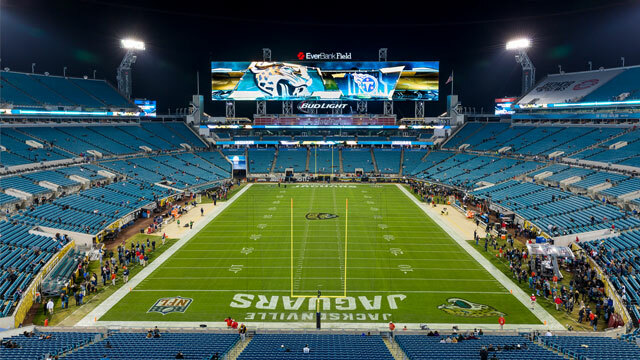 Jacksonville Mayor Lenny Curry said the agreement “further strengthens” the neutral-site tradition of the game, which generates an estimated $35 million in economic activity for the city. For the schools, playing at the neutral site is more lucrative than if the game rotated between the two campuses. Some estimates, now several years old, indicate the schools earn about 50 percent more playing in Jacksonville versus alternating between Gainesville and Athens, Ga. 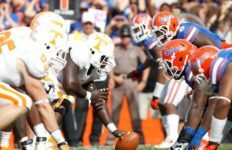 The Gators and Bulldogs first squared off in Jacksonville in 1933 and the game has been played there every year since, with the exception of 1994 and 1995. EverBank Field was being substantially rebuilt in 1994, in anticipation of the Jaguars’ inaugural season the following year. The 1994 game was played on the Florida campus in Gainesville. Though the renovation was complete by the next season, the 1995 game was played in Athens to complete a “home-and-home” series. The green flag goes down at 10:40 a.m. this Sat., March 19 on the prestigious 64th annual international sports car race, 12 Hours of Sebring. Held at the Sebring International Raceway, it is the country’s oldest road racing circuit, built on the site of a World War II Air Force training base. The first race was held there on March 15, 1952. This year’s Mobil 1 Twelve Hours of Sebring fueled by “Fresh from Florida” will have a full field (49 cars) of IMSA WeatherTech SportsCar Championship machines, with many of the same cars and drivers that compete in the famous 24 Hours of Le Mans in France. The endurance race on the 3.74-mile track has 17 turns, 64 pits, longest straight is the Ulmann Straight at 0.63 miles and the facility sits on 445 acres. 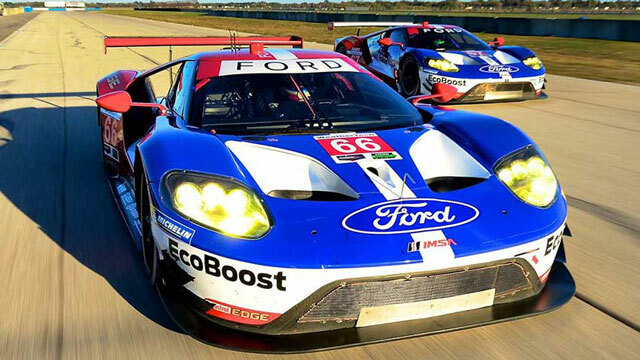 The new Ford GTs will battle Corvette, BMW, Porsche and Ferrari in the GTLM class. The race is one of four in the 2016 Tequila Patrón North American Endurance Cup. Loyal fans from around the country and the world attend this iconic event. The gates opened on Wednesday and are open 24 hours a day through Saturday. Festivities include other races, tailgating at camping areas near the track and a “Rock the Grid” concert on Friday night with Atlanta-based rapper B.o.B. headlining. Time will fly for this 12-hour race. 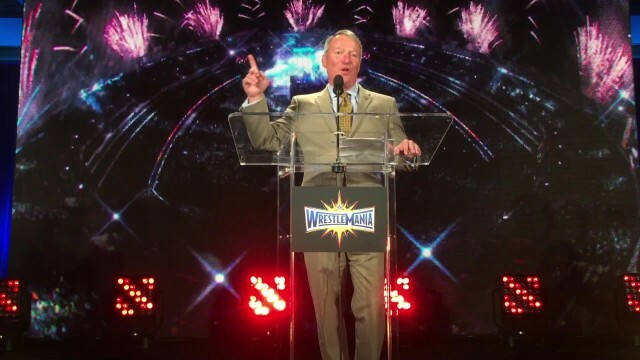 Photo Credit: Top image of Orlando Mayor Buddy Dyer at a press conference on March 8 by WWE.